The contents of this set may have changed over time. 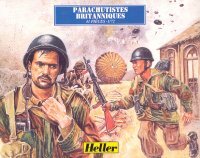 Originally this set was a reissue of Airfix set 01723 (see the review of Airfix British Paratroops for details). However information is that now it contains the old Esci set of British Paras (see the review of Esci British Paratroops for details).